In recent years, the coal industry has employed one in every 10 workers in Gillette and surrounding Campbell County, Wyoming. But coal is declining as a power source. It can’t compete with cheaper, cleaner natural gas, and eventually, climate change regulations are expected to worsen its prospects. With roughly 6.6 billion tons of recoverable coal still in the ground, and an economy hooked on mining and burning it, Wyoming can’t seem to quit coal. 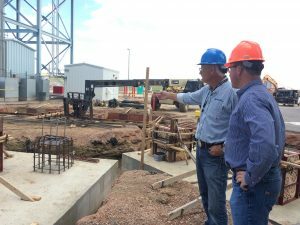 Instead, state leaders are trying to clean it up and find new uses for it at the Integrated Test Center, where researchers hope to capture carbon dioxide emissions and eventually turn those emissions into plastic, carbon-fiber materials, concrete or fuels. So far, though, most “clean coal” initiatives have failed. Carbon-based rubbers, asphalts and chemicals have never achieved large-scale commercial success, partly because it’s easier and cheaper to just use petroleum. Highly touted efforts to capture and store emissions from coal plants have also fizzled because costs spiraled out of control. Even in Wyoming, it’s hard not to wonder: Is it smart to keep betting on coal? 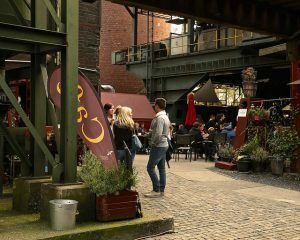 People linger at an outdoor café, children run around a park, and visitors tour a former coal mine, now a thriving museum. The one-time industrial site, which includes an events center, restaurants, and even a Ferris wheel, attracted 1.5 million visitors over the past five years. Zollverein, Germany, once home to one of Europe’s largest coal mines, is now a retail and tourist destination. The second act at Zollverein may provide inspiration — or aggravation — for down-and-out coal communities in Wyoming’s Powder River Basin and elsewhere in the West. March 31, 2016 has become known as Black Thursday in Wyoming since Arch Coal and Peabody Energy announced 465 layoffs at two major mines, amid recent Chapter 11 bankruptcy filings by Arch, Alpha Natural Resources and Peabody. Given the combination of crashing prices, bankruptcies, and a global push to phase out fossil fuels, the layoffs are likely just beginning. In northeastern Wyoming, where coal provides one out of every 10 jobs and has generated billions of dollars for schools, roads and other public services, plans for a popular museum or conference center seem far-fetched. Good jobs are scarce outside the energy industry, and retirement benefits from faltering companies seem uncertain. Many locals wonder how their small towns will survive. Given all this, the official government response feels underwhelming. While Zollverein is a long way from the Powder River Basin — the German mine is near a city of almost 600,000 people — U.S. economists and policy analysts are eyeing Europe, where governments, companies and unions are charting a different path toward life after coal. Overseas, coalfields are also facing job cuts, but unemployment benefits generally last longer, job training and economic-development programs are more extensive and retirement benefits better protected. “The safety net is much different in Europe,” says Robert Godby, a University of Wyoming economist. When the afternoon work break ends at Saratoga Forest Management, an earsplitting ruckus resumes as dozens of sawmill workers return to their posts. Inside the two-story facility, timber is debarked, sawed, sorted and sent to dry in a kiln. By day’s end, the mill will crank out 300,000 board feet of premium studs — enough framing lumber for about 20 average-sized American houses. Not bad for a business that was sitting idle 18 months ago. All the lumber produced here comes from pine-beetle-killed or infected lodgepole pine and Engelmann spruce, with many studs carrying the distinctive blue stain of beetle damage. 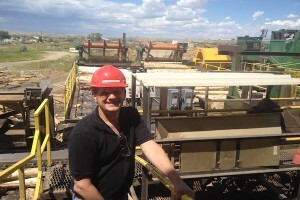 Saratoga, a small southern Wyoming town of fewer than 1,700, sits in the midst of the state’s most severe pine-beetle outbreak, says Clint Georg, who reopened the mill with partners in January 2013 after a 10-year lull. 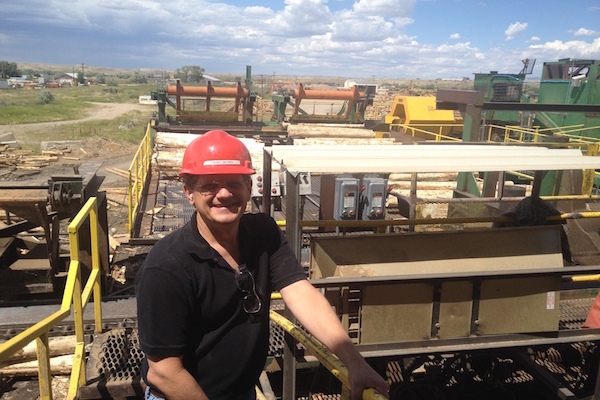 The Saratoga mill and another recently restarted stud mill in Montrose, Colorado, are reviving the Rocky Mountain region’s wood-products industry. Both use beetle-killed wood to produce lumber. The byproducts, like sawdust and wood chips, are used by other businesses to make stove pellets, building materials and other goods. Other scraps go to a biomass power plant to produce electricity. Together, these industries are putting beetle-killed trees to use, perhaps reducing forest fire risks in the process. Yet the mills remain hampered by a lack of raw materials. The Forest Service now sells far fewer board-feet than it once did, as the agency emphasizes new-era forestry that relies less on logging the biggest trees. The stud mills, lacking enough timber, can’t run at full capacity. They need logs and timber sales to stay afloat, Georg says, and the businesses using the byproducts need the mills. With wood trickling in instead of flowing, Georg and others are worried that the uptick in their business may not last. Neither the industry nor the agency has quite figured out how to restore forest health while guaranteeing a steady flow of timber.